Diane Warren is interviewed upon her arrival at the Power Women Breakfast LA. Sacha Voski, Jessicka Adams, Sharon Waxman, Zoe Brock and Alice Evans pose for the camera before the program begins. 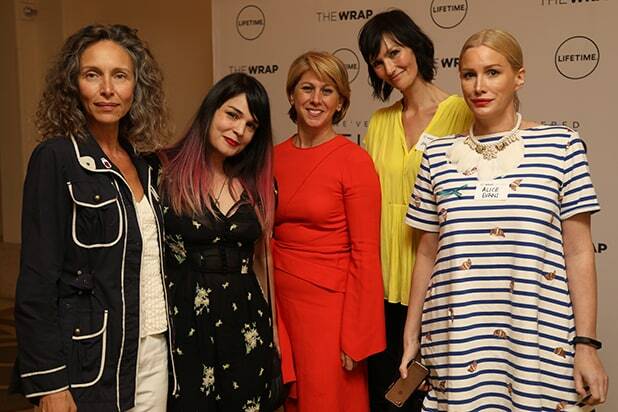 Katherine Kendall, Sharon Waxman, Zoe Brock, Alice Evans, Jessicka Adams and Sacha Voski at the Power Women Breakfast LA. Sharon Waxman and Zoe Brock's baby Willow at the Power Women Breakfast LA. Kelly Bush Novak delivered the opening remarks at the 2017 Power Women Breakfast at the Montage Beverly Hills. Kelly Bush Novak called for 50/50 equality in Hollywood by the year 2020. "The Florida Project" breakout star Brooklynn Prince charmed the audience, and mentioned she'd like to be the first female president. Sharon Waxman and Brooklynn Prince. Brooklynn Prince's dad, Justin Prince, claps from the audience. Members of Lionsgate Women Empowerment supported the breakfast. Journalist Saniya Toiken won the Courage in Journalism Award for her reporting in Kazakhstan. Courage in Journalism Award winner Saniya Toiken (left). Courage in Journalism Award winner Saniya Toiken (center). The Montage was filled with leaders in Hollywood ready to make the entertainment industry more inclusive. Alice Evans watches the program. Actress Claire Florani in the audience. Universal Television President Pearlena Igbokwe and "Friday Night Lights" showrunner Jason Katims spoke at the "Embracing Inclusion" panel with NBC Entertainment President Jennifer Salke. Universal Television President Pearlena Igbokwe at the Inclusivity panel. She said she's surprised she ended up having the job she does because she's a woman of color, rare in Hollywood. The Inclusivity panel included Good Company Venture founder and CEO Monica Owusu-Breen, Universal Television President Pearlena Igbokwe, "Friday Night Lights" showrunner Jason Katims and NBC Entertainment President Jennifer Salke. NBC Entertainment President Jennifer Salke. Sharon Waxman addresses the Power Women Breakfast LA. The silent auction raised money for the Joyful Heart Foundation, a national organization aiding women victims of sexual violence. The Power Women Breakfast franchise is now in four cities: Los Angeles, New York, San Francisco and Washington, D.C.
Attendees enjoyed the Soia & Kyo Pop-Up Fashion Boutique. Soia & Kyo offers accessories and clothing for men and women. More shopping at the Power Women Breakfast. Sharon Waxman, Claire Forlani, Zoe Brock and Lauren Sivan speak out about harassment in the industry. Lauren Sivan used to work at Fox News, and said the culture at the network is changing. TV journalist Lauren Sivan recalled her experience of misconduct by Harvey Weinstein, and noted that since she's not an actress, she didn't have to rely on him to help her career. Luna Blaise and the audience at the Power Women Breakfast. Priya Sopori, Tema Staig, Jeff Vespa and Hilary Shor during the #MeToo TownHall. Photographer Jeff Vespa moderated the #MeToo Town Hall panel at the end of the breakfast along with producer Hilary Shor. Vespa said he's dedicated to hiring more women. Priya Sopori, a partner at Greenberg Glusker, spoke at the #MeToo Town Hall about actionable things that victims can do. Jeff Vespa at the #MeToo Town Hall. Brooklynn Prince was the youngest speaker at the breakfast. One attendee takes some snapshots to remember the event. Harvey Weinstein accuser Louisette Geiss said she left the industry because of her interaction with the indie mogul. 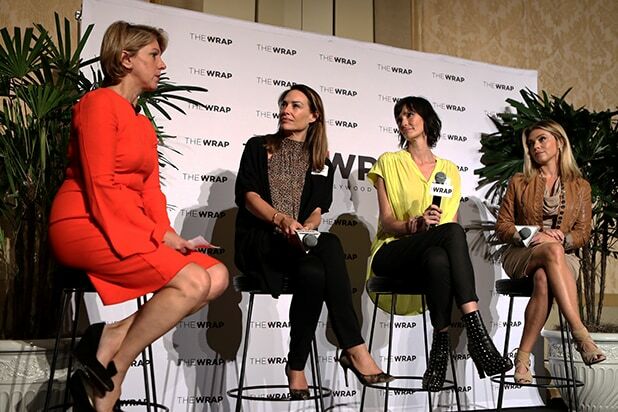 (From left) Claire Forlani, Sharon Waxman, and actress Sharon Lawrence. Zoe Brock arrives at the Power Women Breakfast LA at the Montage in Beverly Hills. She spoke during the "Disruption: Changing a Culture of Systematic Sexism" panel. Actress Camille Guaty arrives at the Power Women Breakfast LA at the Montage in Beverly Hills. Actress Luna Blaise arrives at the Power Women Breakfast LA at the Montage in Beverly Hills. Actress Anna Schafer arrives at the Power Women Breakfast LA at the Montage in Beverly Hills. Christine Devine arrives at the Power Women Breakfast LA at the Montage in Beverly Hills. "Tusk" actress Harley Quinn Smith arrives at the Power Women Breakfast LA at the Montage in Beverly Hills. Songwriter Diane Warren arrives at the Power Women Breakfast LA at the Montage in Beverly Hills. Actress Heather McComb arrives at the Power Women Breakfast LA at the Montage in Beverly Hills. Actresses Harley Quinn Smith and Claudia Lee arrive at the Power Women Breakfast LA at the Montage in Beverly Hills. Zoe Brock and Claire Forlani embrace. Jessica Barth greets Sharon Waxman.